Please note: deck and tackle are not included. This massive and fearsome weapon was carried on the foredeck of the Victory at Trafalgar. 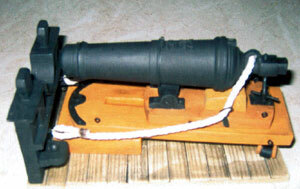 It was a short range gun which could throw a 64 pound cannonball or an assorted mass of bits of metal of various sizes. It was an antipersonnel gun in essence, rather like a gigantic blunderbuss and could clear a deck section of the enemy with ease. Our model is complete with a scale elevating screw and the carriage has side facing castors to allow the gun to be trained in azimuth.